Donald Trump is Russia’s press secretary. No one defends the Kremlin’s interests like the American president-elect. President-elect Donald Trump speaks at a news conference at Trump Tower in New York City on Wednesday. 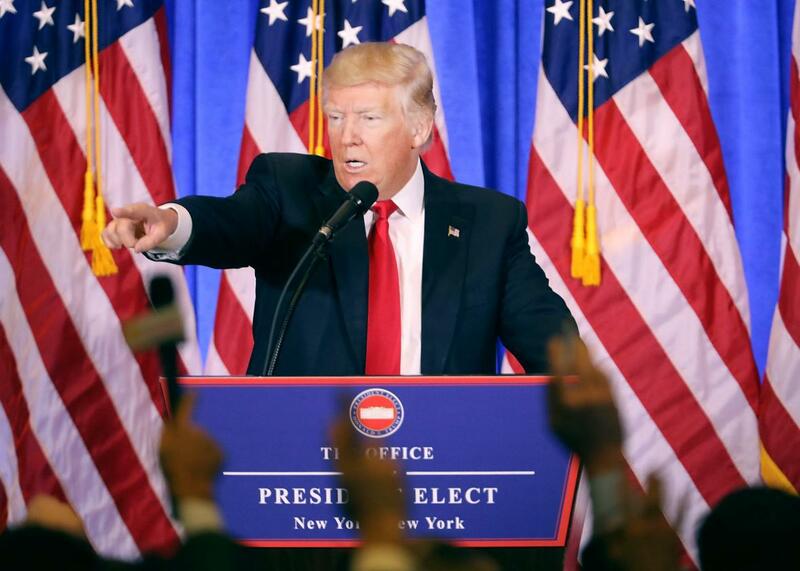 On Wednesday, Donald Trump held his first press conference in more than half a year. He presented himself as the victim of a scurrilous dossier—compiled by a former intelligence operative and published by BuzzFeed—that recounted a series of allegations about Trump’s personal and financial ties to Russia, as well as purported collusion between Trump associates and associates of the Russian government. Trump used the dossier to shame the media and to deflect attention from credible evidence against Russia, most notably in an intelligence community report that was presented to Trump on Friday. The press conference was a blizzard of evasions, diversions, hedges, excuses, rationalizations, and stonewalling. Trump’s arguments minimized the case against Russia, and several of his statements flatly contradicted the intelligence community’s report. A week before he assumes the presidency of the United States, Trump continues to behave like a press secretary for Russia. Here’s how he bobbed and weaved. 1. Russia did it … maybe. Trump was asked whether he accepted the IC’s assessment “that Vladimir Putin ordered the hack of the DNC.” He replied: “I think it was Russia. But I think we also get hacked by other countries and other people.” Later, Trump hedged his answer. A reporter told him: “You said just now that you believe Russia indeed was responsible for the hacking of the DNC and John Podesta’s emails, et cetera.” Trump disputed that description of his view. “It could have been others also,” he said. 6. Nothing in the dossier can be true. Trump ridicules the IC for its erroneous assessment of Iraq’s weapons of mass destruction. But it’s Trump, not the IC, who has adopted a firm belief about Russia and dismissed the possibility that intelligence might contradict it. On Wednesday, referring to the dossier, a reporter asked Trump whether he would “reconsider” his position if intelligence agencies concluded “that any of it is true.” Trump rejected that scenario out of hand. “There’s nothing they could come back with,” he said. 7. I won’t release documents that could falsify my denials. “I have no deals that could happen in Russia, because we’ve stayed away,” Trump told the media. “I have no deals, I have no loans, and I have no dealings.” A reporter pressed him: “Will you release your tax returns to prove what you’re saying about no deals in Russia?” Trump refused. “I’m not releasing the tax returns, because, as you know, they’re under audit,” he said. That’s a bogus excuse: The IRS has said taxpayers are free to release their returns while being audited. But Trump brushed off the request anyway. “The only one that cares about my tax returns are the reporters,” he said. Trump has engaged in this behavior all along. He has exploited the material Russia hacked and leaked. He has minimized Russia’s misconduct. He has disputed, and often scorned, evidence of its guilt. He has ignored U.S. intelligence. He has bragged about Putin’s admiration of him. He has mocked Democrats and Republicans who side with U.S. intelligence against Russia. Trump may be right that the dossier published on Tuesday is garbage. But if the charge against him is that he defends Russia’s interests over America’s, you don’t need to read the dossier. All you need to do is listen to what he says. Thanks to Tom Corbani and Lily Tyson for research assistance.